Acquired: The Lions acquired Brandon from the Montreal Alouettes in exchange for future considerations on January 15, 2018. 2018: Injury was the prevailing theme for Brandon’s season in 2018. The bruising runner sustained an injury during training camp in Kamloops which forced him to miss the first four games of the season. 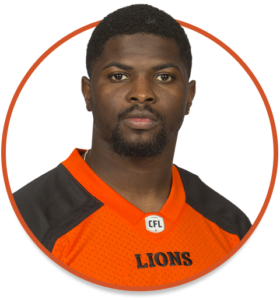 He made his Lions debut on July 20 against the Ottawa RedBlacks, running for 91 yards and one touchdown on 17 carries. Unfortunately, Brandon suffered a torn ACL against the RedBlacks and was forced to miss the remainder of the season. 2017: Brandon appeared in five games for the Montreal Alouettes, totalling 291 yards on 49 carries and catching 17 passes for 100 yards. He set a new career high by averaging 5.9 yards per carry in 2017. 2016: Brandon turned in the best numbers of his career with the Als, running for 495 yards on 113 carries and four rushing majors. His role expanded in the passing attack as well, tallying 35 receptions for 305 yards and two scores. 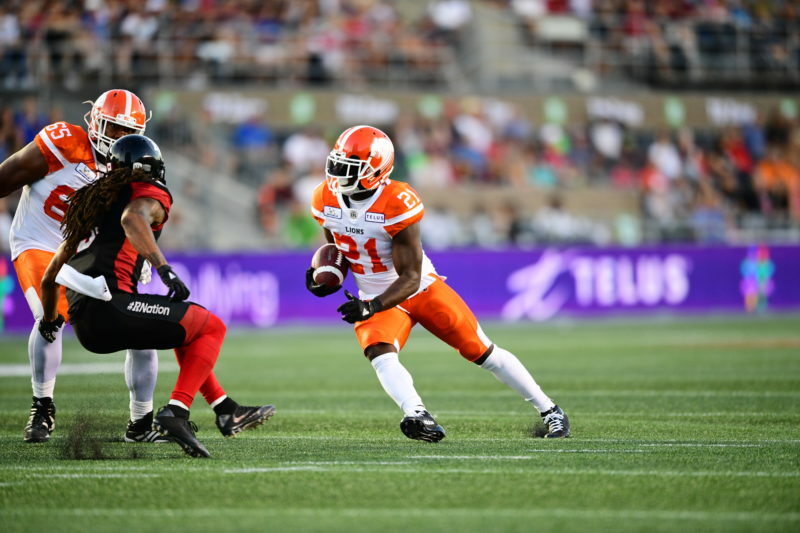 2015: Rutley took a big step forward in his second season in Montreal, carrying the rock 83 times for 454 yards, good for a 5.5 yard per carry average. He also improved in the receiving game, hauling in 20 passes for 286 yards and two touchdowns. 2012-2014: Brandon was invited to a rookie minicamp with the Oakland Raiders after going undrafted in 2012, but was not signed to a contract. He then headed north, signing with the Hamilton Tiger-Cats in August of 2012. Rutley carried the ball twice for 17 yards before being placed on injured reserve at the end of September and was released by the Ticats on November 2. After being out of football in 2013, Brandon signed on with the Alouettes for the 2014 season. He spent the bulk of the season on the practice squad, but made a significant impact after being activated for the playoffs. Brandon was very effective against the Lions in the Eastern Semifinal, rushing for 98 yards on 15 carries and scoring one touchdown. The following week, he rushed for 52 yards on 11 carries in the Eastern Final. 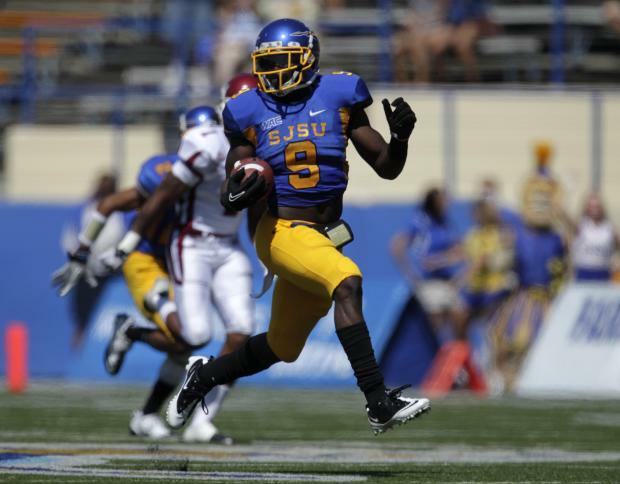 2008-2011: Brandon had a very productive career with San Jose State, running for 1,779 yards and 21 rushing touchdowns while catching 70 passes for 668 yards and one receiving score across 45 games. He was also a factor in the return game for the Spartans, fielding 82 kickoffs and returning them for 1,812 yards. Brandon earned second team All-WAC honours as a senior, rushing for 903 yards on 216 carries with 12 touchdowns. A communications major at San Jose State, it makes sense that Brandon’s favourite subject in school was public speaking. He enjoys listening to R&B music and lists Miguel as his favourite musician to listen to. Brandon is a fan of Netflix marathons, particularly after a new season of House of Cards has been released. A lover of comedy and making people laugh, Brandon cites Wedding Crashers as his favourite flick. He hopes to one day travel Brazil.